I don't have a formula but this is a fairly typical start to a painting. I've blocked in most of the areas with the exception of the roof of the building. 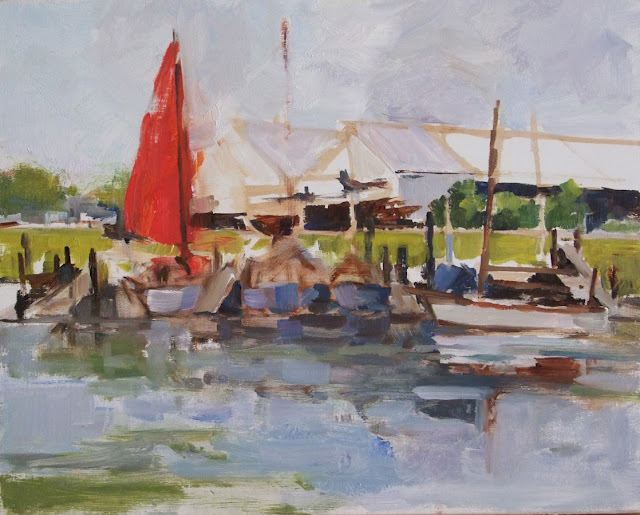 I started by placing the main shapes on the panel with diluted warm reddish brown and then scumbled in the darks in the shadow of the boat shed, the boat on the bank and the undersides of the docks and foreground boats. I laid in the red sail as it is the focal area followed by the greens. It is basically a composition made up of horizontals (the greens and the blue-greys of the sky and water) broken by the verticals of the masts. Nice painting but as you have said that it needs refinement. 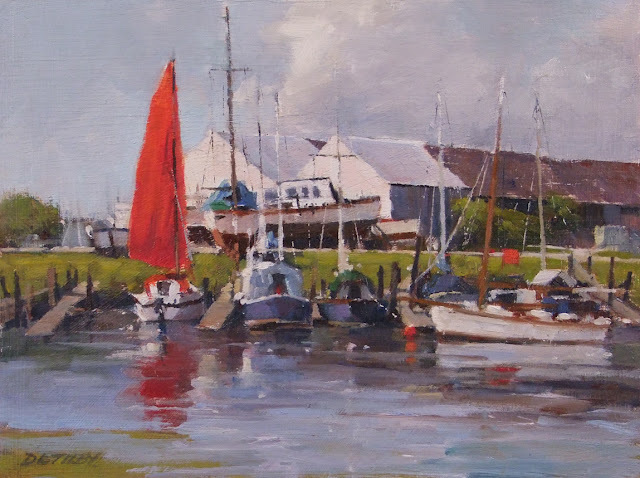 On a closer look, the boats and other shades look scattered and do not give a neat look to the painting. However, it is a good attempt. I didn't intend my comments to mean that I felt the finished painting needed more refinement. Rather, I wish I had left it less refined, somewhere between the block in and the finished painting.